The mini tool of carbon side is very light and handy with the common functions. It will not cause any load if riders put it in the pocket during riding bikes. 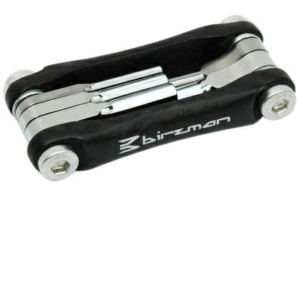 Birzman's Cicada tool is the beautifully realised evolution of the Feexman Carbon tool. In its five functions guise the weight of the tool is so low you will keep checking your pockets to make sure it is there. All Birzman multi-tool bits are forged and CNC machined. This technology provides benefits including weight saving by using less material, increased strength, a centre tool pivot and a neater finish over the extruded wrapped tool bits usually seen on multi-tools. This tool has unidirectional carbon fibre side plates with alloy bolts.